When Wham! 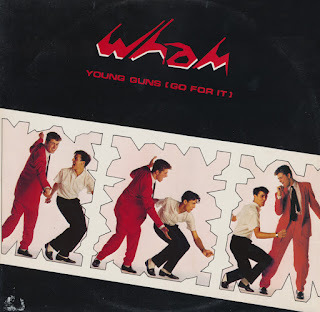 released 'Young guns (go for it)' in October 1982, it broke new ground for the duo George Michael and Andrew Ridgeley. The single became a number 1 hit in Sweden, and reached number 3 in the UK. It was only their second single, and they were already on the way to superstardom. While the single was entertaining, the extended mixes were intriguing. There were actually two remixes of this song. A 5'10 minute remix has become by far the most widespread, having had a release even on CD ('Best remixes' in Japan and 'The 12" album' in Europe). The 7 minute remix featured on this 12" single is much harder to find: it was only ever released on a 12" single in the USA and this one, made in Holland. And yes, you can find it on CD, if you are able to find the 1996 compilation album 'Club Epic' or the 2013 'Dance Classics Pop Edition vol. 10', released in the Netherlands. 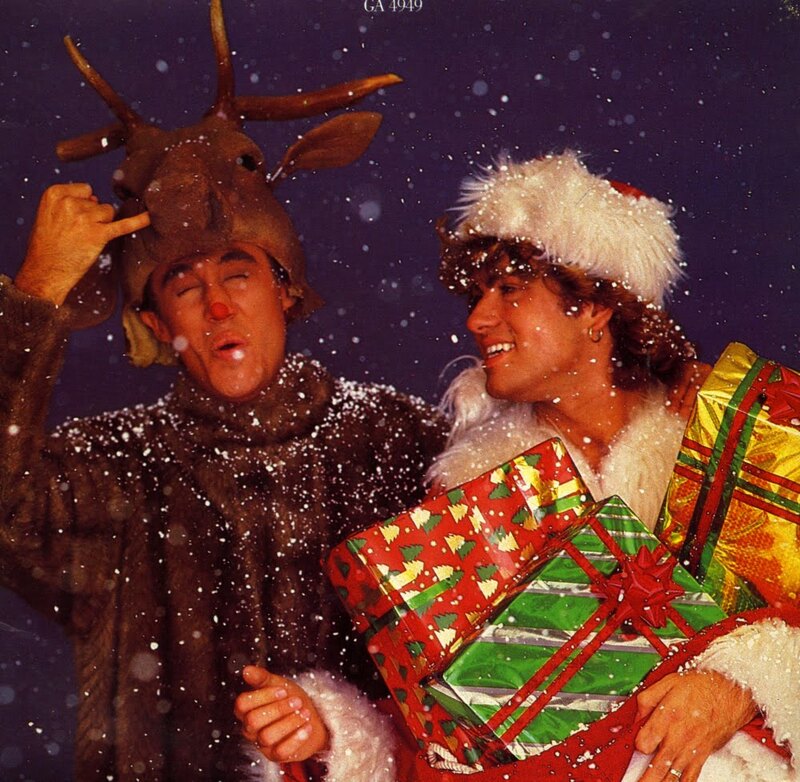 Why Sony Music have never made a definitive Wham! box set, I'll never know. 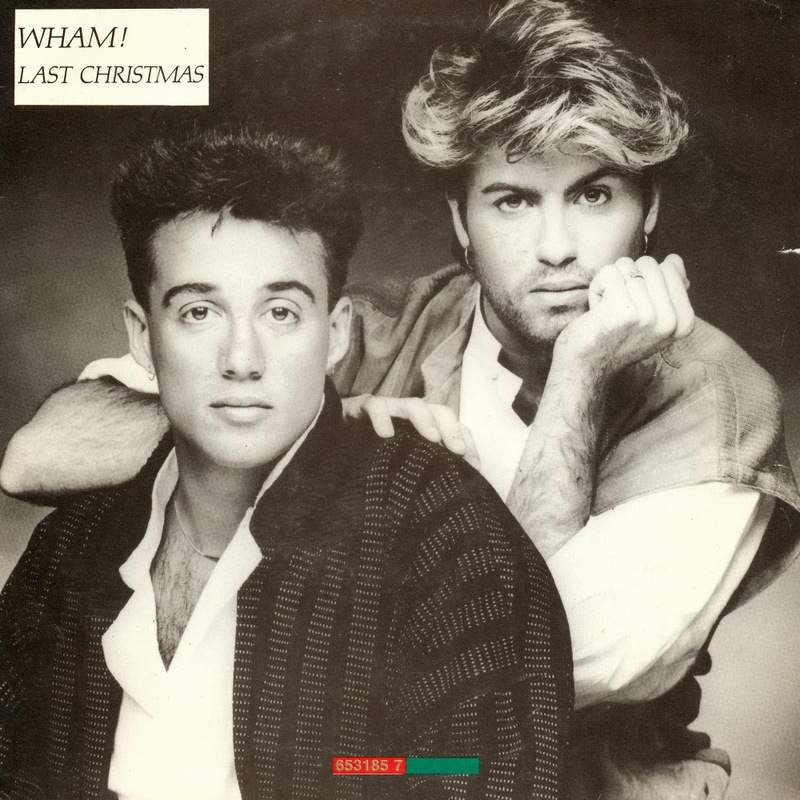 One of the best known Christmas songs of all time, 'Last Christmas' was originally released in 1984 but re-released almost every year since then. I already wrote about the 1989 re-release on this blog five years ago, but this time I'd like to present to you two re-releases that I bought earlier this year. The 1985 edition featured 'Blue (live in China)' on the B-side and came in the same sleeve that was used every year since then. My copy, pictured above, was created in the UK and comes in the kind of thick cardboard sleeve that is so uniquely British. The 1988 edition, pictured below, was made in Holland and inevitably looks cheaper. There is also an interesting mistake on the back cover, as it promises 'Everything she wants (live in China)', but apparently this is caused by them using the 1985 sleeve and simply replacing the line 'Blue' but leaving the line with 'live in China' intact. Wham Rap (US remix) - Wham! 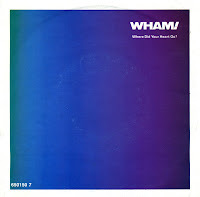 I already own a copy of the 1982 Wham! 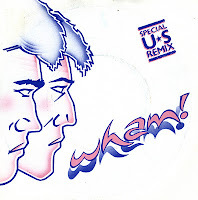 single 'Wham rap', but this one seemed different because of the 'Special US remix' badge on the sleeve. And indeed, when you compare the intro of the other single with this one, you'll notice that it sounds different. It gets better. 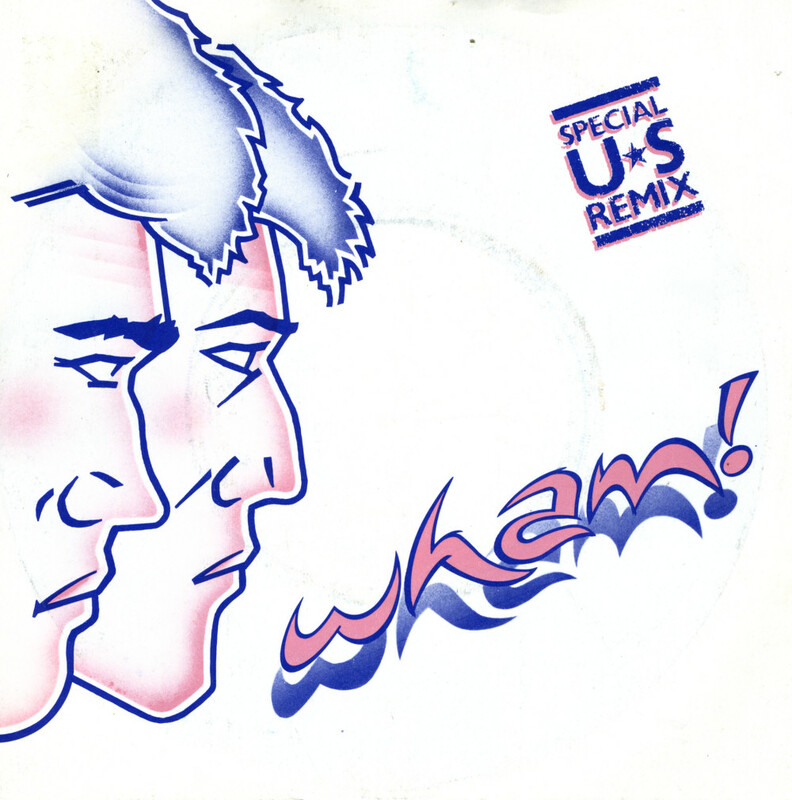 Whereas the sleeve and label of this single speak of a 'Special US remix' and a 'Special club mix', the tracks included on this disc are in fact part 1 and part 2 of a special US remix, which is also included on the 12" single as the A-side. This single was released in 1983 as a reissue, which - contrary to the 1982 release - charted in the UK and Australia, peaking at number 8 and 9 respectively. Since then, the single has been re-released almost every year. This single is the re-release from 1989, featuring a different sleeve. 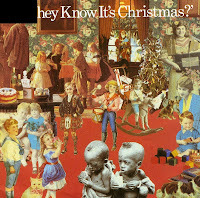 The rest is the same: the Christmas song and its B-side, the great track 'Everything she wants', which kept the single in the charts in January 1985. 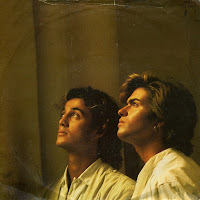 'Where did your heart go' was originally released as part of the double single 'The edge of heaven', released to signal the end of the duo Wham! in June 1986. Always in need of 'milking it', the record company decided to release the track separately as a single in October 1986. The setup didn't work as most people already had the track - only the most avid fans still bought the single despite the absence of anything new on it. The single peaked at number 50 in the USA and number 54 in Australia. The song was not written by George Michael, like most of Wham! 's material, but instead was a cover of the 1981 track by Was Not Was. It was written by David and Don Was. 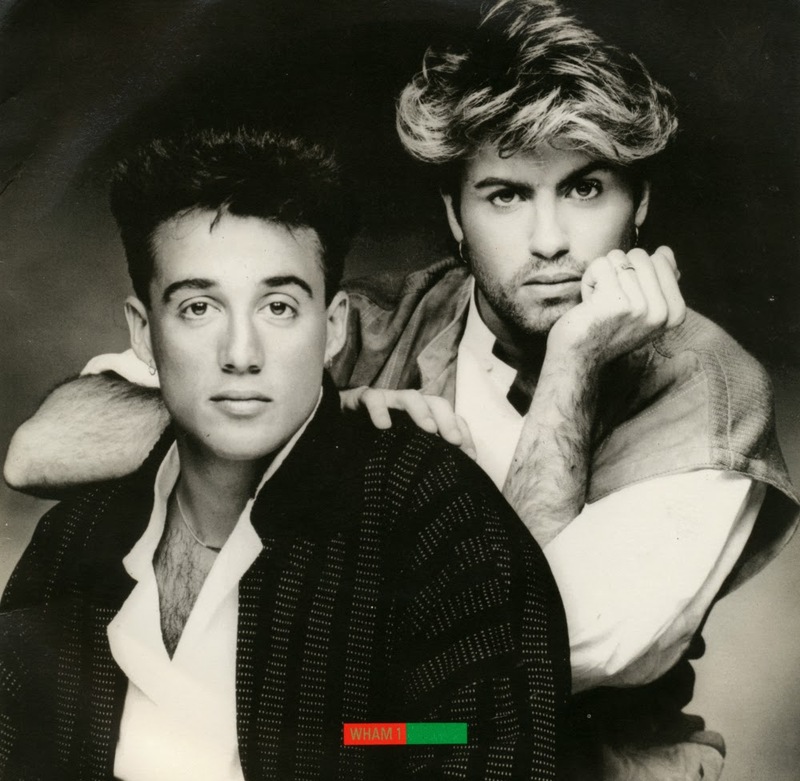 One of the Eighties' ultimate pop tracks was Wham! 's 'Wake me up before you go-go'. George Michael was inspired to write the song when his Wham! partner Andrew Ridgeley left a scribbled note to his parents reading 'Wake me up before you go', but accidentally wrote the word 'up' twice - so he decided to repeat the word 'go' as well. 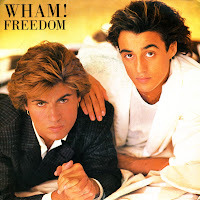 Released in May 1984, Wham! presented themselves as a sunnier, less pretentious band, moving away from their politically charged songs from their previous album. The song reached number 1 in both the UK, the USA and the Netherlands. 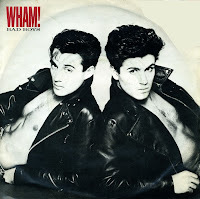 'Bad boys' was a 1983 hit single for Wham!, taken from their debut album 'Fantastic'. The lyric of the song was written by George Michael from a teenager's perspective, but also including the concerns of parents, ultimately asking 'Why do you have to be so cruel?'. The single reached number 2 in the UK singles chart, number 14 in the Dutch Top 40 and number 60 on the US Billboard Hot 100 chart. George Michael later denounced 'Bad boys' as a song he hated, stating it was 'like an albatross round my neck'. 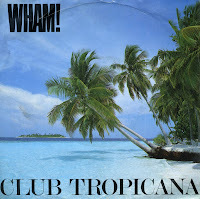 The song was omitted from the 1997 compilation album 'If you were there (The best of Wham)', despite the album including tracks that weren't even released as singles. 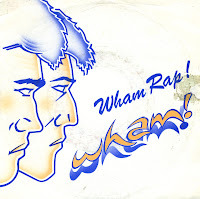 'Wham Rap!' was originally Wham! 's debut single. It failed to make any impact. After the duo had achieved their breakthrough with 'Young guns (go for it)', the single was re-released. This time around, it reached number 8 in the UK singles chart and number 9 in the Dutch Top 40. Although rap was still an underground and almost exclusively American phenomenon in the early Eighties, George rapped a number of verses about the joys of living every day to the fullest, which meant that being employed was not an option, and that 'having fun with the boys down the (welfare) line' was a better way to spend the day. Wham! enjoyed their first UK number 1 hit with 'Wake me up before you gogo' in the summer of 1984. When the next single 'Freedom' was released, no-one could have suspected that it would become another charttopper for the duo. Not only that, but it also became the number 10 best selling single in the UK that year. Meanwhile, the duo went on tour in China. The music video showed images from that tour. 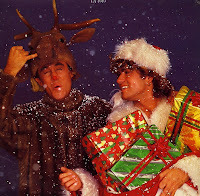 Wham were the first 'western' band to tour the Asian country. 'Death by matrimony' is a phrase in the lyric of this song, which is a good summary of what the song is about. 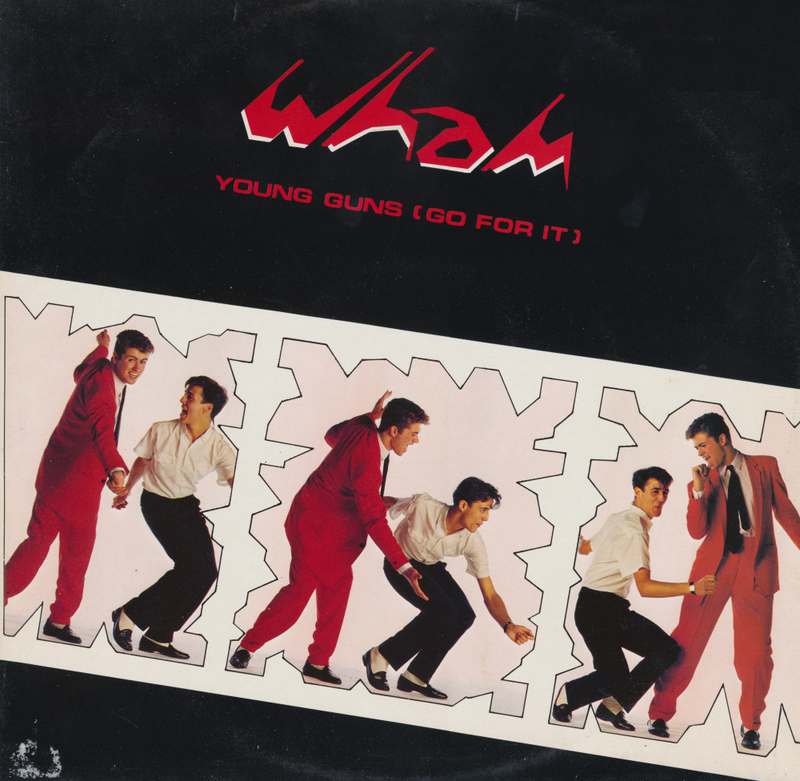 George Michael wrote 'Young guns (Go for it)' about a teenage lad's worry that his best friend was getting too committed to a girl when he should be enjoying his youth and the single life. One of the most talked about lines in the song is the spoken line 'Caution pays'. Since the line is played at a lower speed than originally recorded, people mistakenly thought that the line is 'Abortion pays', which, ironically, would have fit in with the overall theme of the song. 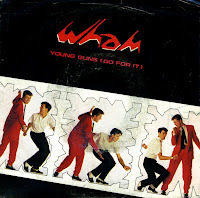 'Young guns' became Wham! 's first hit, reaching number 3 in the UK and number 4 in the Netherlands. Due to this success, the previous single 'Wham Rap' was re-released, becoming a top 10 hit for the band in both countries as a result. Club Fantastic megamix - Wham! 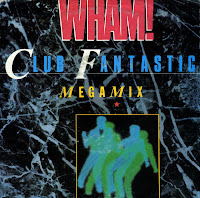 'Club Fantastic megamix' is a unique Wham! single, because it's the only one that didn't become a top 10 hit in the UK. It still peaked at number 15, so that wasn't too bad, but all the other singles they released during their career made it into the top 10, which is quite a feat! The megamix was a medley of three album tracks from Wham's debut album 'Fantastic': 'A ray of sunshine', 'Love machine' and 'Come on'. The band members George Michael and Andrew Ridgeley did not approve of this release. 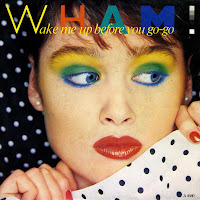 It was released three months after Wham! had begun proceedings to leave the label Innervision records. Wham! had made a name for themselves with socially conscious singles like 'Wham rap' and 'Young guns'. When they released 'Club Tropicana' it seemed like a deliberate move away from that. But in reality, the song was a satire of the boom for cheap package holidays for young, single people. The B-side is what interests me the most on this single. 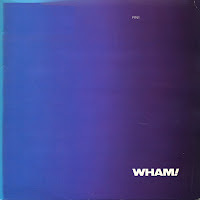 It's the track 'Blue (Armed with love)', which is a bit of a rarity in Wham! 's catalogue. I've known this track for a long time, but I didn't know it was the B-side of 'Club Tropicana'. I'm glad to finally have it on 7" vinyl. 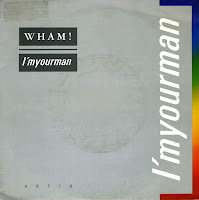 'I'm your man' was released in November 1985 after Wham! 's world tour, followed by a period of rest. The last people had seen of Wham! was during Live Aid in the Summer. Thus, the single was long-awaited. It was a number 1 in the UK and peaked at number 4 in the Netherlands. Within a few months, Wham! announced their split. 'I'm your man' did not appear on any studio album, and so its only appearance on an album was on 'The final', the compilation album that was released in 1986 to commemorate the end of Wham! 's career. In 1995, Lisa Moorish covered the song. 'The edge of heaven' was Wham's last single. It was released in the spring of 1986, after George Michael and Andrew Ridgely announced their breakup. The single preceded a historic farewell concert at Wembley Stadium in London on June 28, 1986. The single reached number 1 in the UK and the Netherlands that summer. It was sold as a double single including four tracks. One of them was 'Where did your heart go', which was also released separately as a single in some territories. The song, originally recorded by art-rock ensemble Was (Not Was), was a downbeat and sombre affair that would fit seamlessly onto George Michael's later solo albums. The band had been together five years, selling close to 20 million albums and 10 to 15 million singles.